Academic studies of the Civil War and historical memory abound, ensuring a deeper understanding of how the war’s meaning has shifted over time and the implications of those changes for concepts of race, citizenship, and nationhood. The Reconstruction era, by contrast, has yet to receive similar attention from scholars. 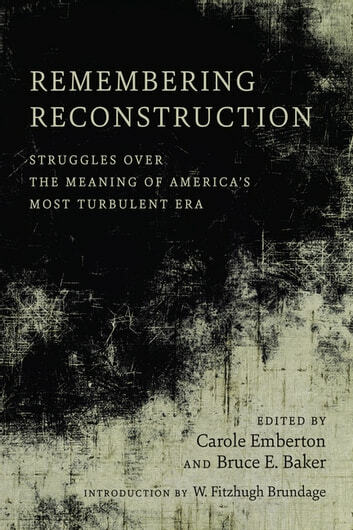 Remembering Reconstruction ably fills this void, assembling a prestigious lineup of Reconstruction historians to examine the competing social and historical memories of this pivotal and violent period in American history. Many consider the period from 1863 (beginning with slave emancipation) to 1877 (when the last federal troops were withdrawn from South Carolina and Louisiana) an “unfinished revolution” for civil rights, racial-identity formation, and social reform. Despite the cataclysmic aftermath of the war, the memory of Reconstruction in American consciousness and its impact on the country’s fraught history of identity, race, and reparation has been largely neglected. The essays in Remembering Reconstruction advance and broaden our perceptions of the complex revisions in the nation's collective memory. Notably, the authors uncover the impetus behind the creation of black counter-memories of Reconstruction and the narrative of the “tragic era” that dominated white memory of the period. Furthermore, by questioning how Americans have remembered Reconstruction and how those memories have shaped the nation's social and political history throughout the twentieth century, this volume places memory at the heart of historical inquiry. Planters and the Making of a "New South"